This is a picture of Noah just seconds after he was born at 3:30 am on Thursday, September 16. Noah was turned toward the side and couldn't fit out, so he had a forceps delivery. As a result the pediatrics team gave him a pretty strong going over. 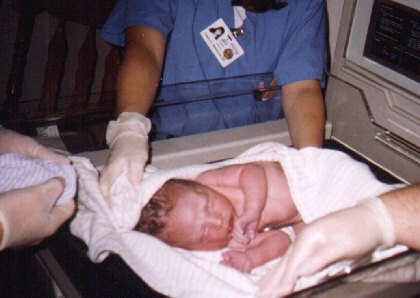 Here, he's under a warmer and they're conducting Apgar tests (he scored 9 out of 10 at 1 and five minutes).